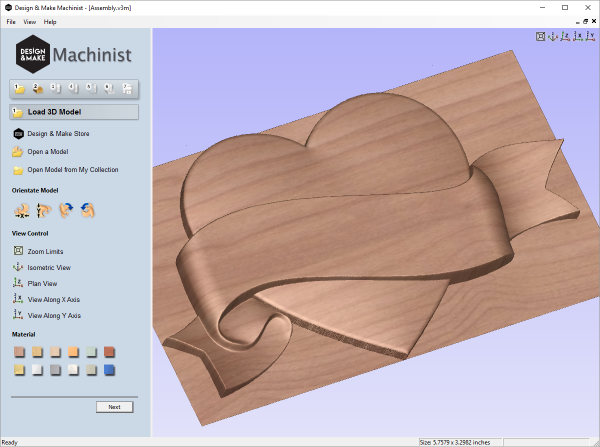 Design & Make Machinist can be used to preview Vectric 3D Viewer files in a fully interactive virtual 3D environment on your own PC (XP SP3 or later). This allows you to see the quality and variety of the individual models in our store before you make your purchase. You can also find the associated Vectric 3D Model in our store for any preview you have previously downloaded using Machinist - simply open the saved preview file, click Next and follow the instructions. You are welcome to use these files as a sales tool to sell 3D design ideas to your customers. Note: Preview files cannot be machined.